Following the California Gold Rush, pioneer entrepreneurs built canals and reservoirs designed to move Mokelumne River water from the Sierras to the Amador mines to power their stamp mills. 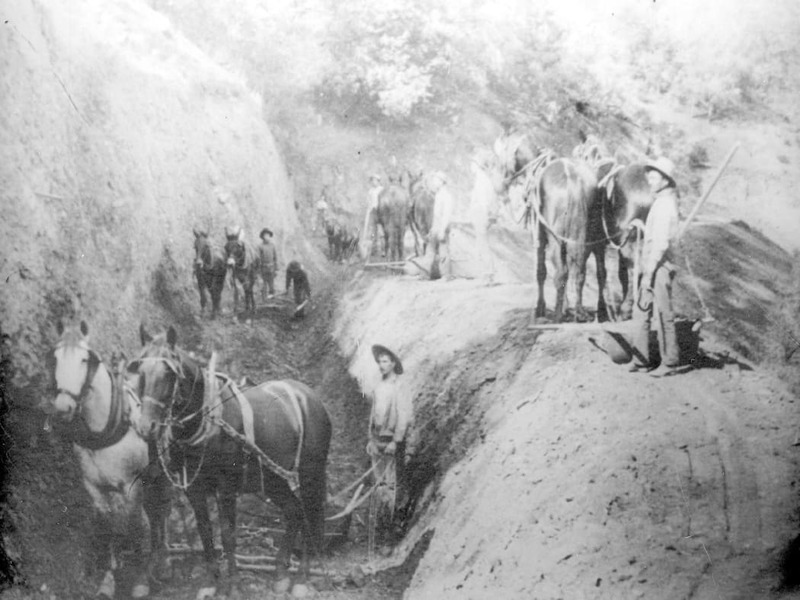 Those canals became the foundation of water service in Amador County. In 1959, the Amador County Water Agency was formed as a public non-profit special district by the California Legislature and ratified by the voters of Amador County for the purpose of providing water, wastewater and storm drain services to Amador County. In 1985 the Agency purchased the Amador Water System from Pacific Gas & Electric. Several more water and wastewater improvement districts have since elected to become part of the Agency. In 1995, the Agency changed its name to the Amador Water Agency, to more clearly demonstrate that it operates independently from Amador County government. Serving approximately 10,000 customers in Amador County today, the Agency is the primary provider of drinking water. In addition to residents and businesses in unincorporated areas, the Agency sells water to the cities of Ione, Jackson, Plymouth, Sutter Creek, Amador City and several special districts. The Amador Water Agency serves approximately 10,000 customers in Amador County today and is the primary provider of drinking water. In addition to residents and businesses in unincorporated areas, the Agency sells water to the cities of Ione, Jackson, Plymouth, Sutter Creek, Amador City and several special districts. Over the 50 years since its formation, the Amador Water Agency purchased the Amador Canal System from PG&E, in 1978 constructed the Central Amador Water Project and the Buckhorn Water Treatment Plant to provide water to hundreds of upcountry residents, updated the Tanner Water Treatment Plant, built the Ione Pipeline and a new water treatment plant and storage tanks in Ione, now provides treated water to Jackson, added new wells to the Lake Camanche Village and La Mel Heights systems, operates 10 small community water systems, completed the 9-mile-long Amador Transmission Pipeline and has completed the Plymouth Pipeline. The Agency must be ready and able to respond to the water and wastewater requirements to support land use decisions made by city and county governments of Amador County. The Amador Water Agency is one of the major employers in Amador County and currently employs a work force of about 40 who are challenged to meet the growing service demands of a diverse county of 568 square miles, ranging in elevation from 200 to 9000 feet and including 5 cities and several unincorporated communities. 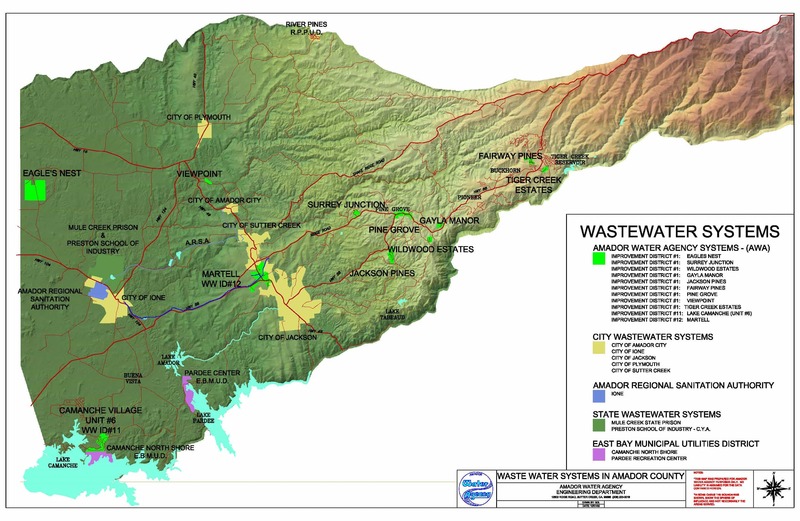 The Amador Water Agency owns and operates 11 small community wastewater systems. The AWS, which was formerly owned and operated by PG&E, is commonly referred to as the “down-country system.” This water system serves the areas of Jackson, Martell, Sutter Creek, Sutter Hill, Ione, Amador City, and Drytown with treated water from two water treatment plants at Sutter Hill and Ione. 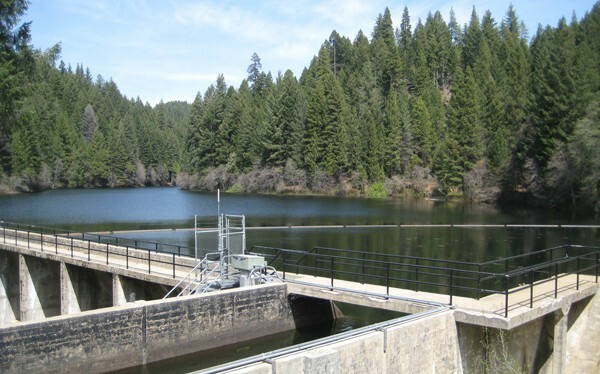 This system also serves untreated water from the Amador Canal to hundreds of customers between Lake Tabeaud and Sutter Hill, and Sutter Hill and Ione. The primary source of consumptive water is the Mokelumne River which is supplied from rainfall and snowmelt from the Sierra Mountain Range. This water is diverted into the Amador Canal at Lake Tabeaud and is gravity fed to the two water treatment plants for treatment. The CAWP system provides wholesale treated water to the “upcountry” communities of Sunset Heights, Jackson Pines, Pine Grove, Pine Acres, Ranch House Estates and vicinity, Pioneer, Rabb Park, Ridgeway Pines, Silver Lake Pines, Sierra Highlands, Fairway Pines and the Mace Meadows area. In addition to delivering wholesale water, the Agency also runs the day-to-day operations in the Pioneer area, the Ranch House area, the Pine Acres area . 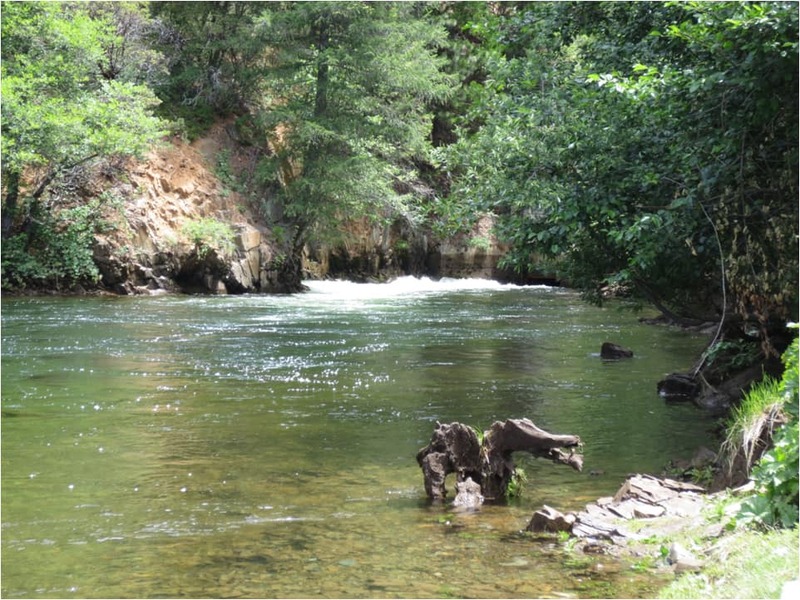 The primary source of consumptive water is the Mokelumne River which is supplied from rainfall and snowmelt from the Sierra Mountain Range. This water is diverted from the Tiger Creek Afterbay and is pumped 1,200 feet to our Buckhorn Water Treatment Plant for treatment and distribution to the above mentioned areas. LCV is a major subdivision consisting of several Units and is located in the far western portion of Amador County. This area receives both water and wastewater service from the Agency. The water supply for LCV is from groundwater wells. The groundwater system currently consists of three operating wells, six storage tanks, two hydro pneumatic tanks, and an interite that connects two systems. Wastewater service is provided to Unit 6 only. Wastewater is collected and pumped through four pump stations, treated at a wastewater treatment plant and is disposed of through spray disposal fields. The La Mel Heights subdivision is served by a communty well, with storage tanks. 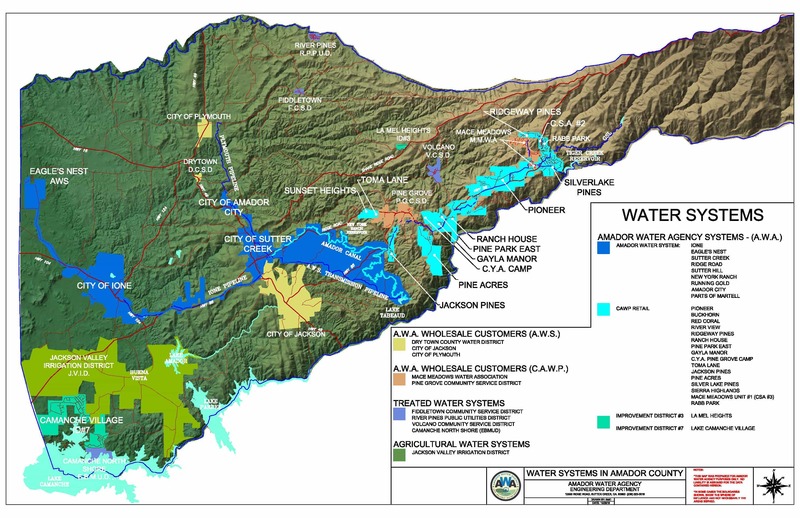 The Amador Water Agency owns and operates several different wastewater systems in various areas throughout Amador County. Currently the Agency serves the communities of Fairway Pines, Tiger Creek Estates, Gayla Manor, Wildwood Estates, Surrey Junction, Jackson Pines, Pine Grove, Martell, Viewpoint Estates, Eagles Nest, and Lake Camanche Village Unit 6. The wastewater generated in Martell is piped to the City of Sutter Creek for treatment. The remaining systems consist of subsurface leach fields and spray disposal fields.